Suspect worked with local imam to build ISIS presence in Pakistani capital, earned $600 for each person they recruited. Pakistani security forces have arrested a member of the Islamic State (IS or ISIS) jihadist group and two accomplices in eastern city of Lahore, officials said Wednesday. "A Pakistani Syrian man named Yousaf Al-Salafi and two of his accomplices have been arrested two days ago," a senior security official told AFP. "During investigation he has confessed that he was setting up IS operations in Pakistan," the official said on the condition of anonymity as he was not authorized to speak to media. Al-Salafi, believed to be about 40-years-old, entered Pakistan around five months ago via Turkey and worked with Hafiz Tayyab, an Imam at a local mosque, to recruit Pakistani men to fight in Syria - charging ISIS about $600 for each person they sent, the official said. The other accomplice was identified only as Doctor Fuwad from the industrial city of Sialkot who arranged visits for Al-Salafi to various madrassas in that city and neighboring Gujranwala, he added. During the past five months Al-Salafi also visited Pakistan's northwestern tribal areas that border Afghanistan and met with Pakistani Taliban terrorists, the official said. "If he had been free, he might have launched some big attacks in Lahore and other cities," the official said. A local intelligence official also confirmed the arrests. There are concerns in Pakistan of ISIS tapping support within Pakistan and Afghanistan, a region awash with dozens of militant groups. 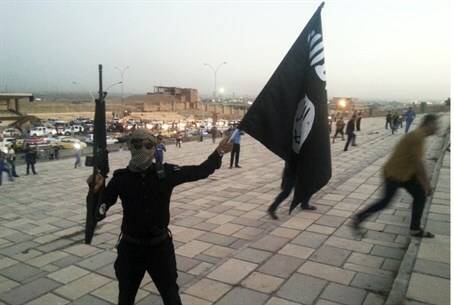 Leaflets calling for support for ISIS jihadists have been seen in parts of northwest Pakistan and pro-ISIS slogans have appeared on walls in several cities. A video was also recently online purportedly showing dozens of former terrorists of the Pakistani Taliban pledging allegiance to ISIS and beheading a man they identified as a Pakistani soldier.